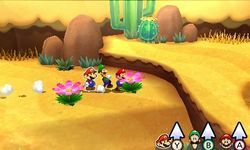 Doop Doop Dunes is a desert area found in Mario & Luigi: Paper Jam. It is west of Bowser's Castle, east of Sunbeam Plains, north of Twinsy Tropics and south of Mount Brrr. Mario and co. cross the desert to reach Bowser's Castle to save the Princesses. When they first arrive, they encounter Nabbit and give chase, retrieving two Bros. Attacks. However, as they continue, they are thrown back by a Big Pokey and Paper Tower Power Pokey, landing behind a stone brick. Here, they learn the Trio Hammer and continue, but the two Pokeys flip the bridge, sending Mario and Luigi down into Doop Doop Dunes Grotto. After exiting Doop Doop Dunes Grotto, they arrive at a Toad village. They rescue more Paper Toads, which build them a large Trampoline they can use to reach the Pokeys. After returning to the grotto to do so, they proceed, only to encounter Kamek and Paper Kamek. The two create Papercraft Kamek, and an army of Papercraft Goombas and Papercraft Pokeys, but Toadette arrives with Papercraft Luigi. After a battle, the bros emerge victorious, and can finally cross the bridge to Bowser Castle. However, after they cross, the bridge is hit with a cannonball, and a second one knocks out the Mario Bros. They are arrested by Wendy, Roy, Larry, Ludwig and an army of Chargin' Chucks. After falling off Mount Brrr, the team arrives in Doop Doop Dunes again. They can optionally encounter Nabbit two more times for more Bros. Attacks. When they try to leave the desert, they will be ambushed by the same Chargin' Chuck army as before. This page was last edited on October 21, 2018, at 16:50.